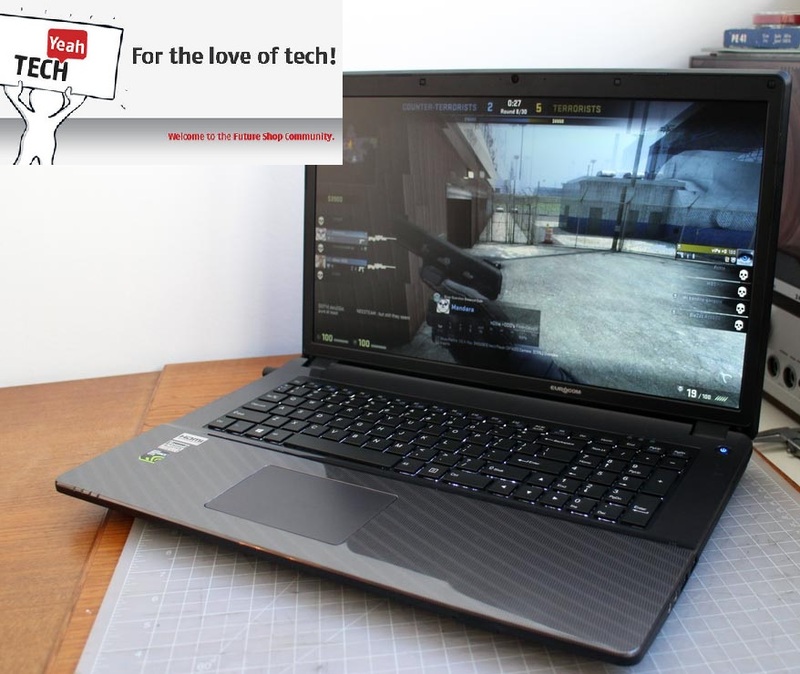 The all-round 17.3" notebook that also offers a lot besides the performance. The latest model I’ve looked at is the Electra 3 from Eurocom. I’ve been a big fan of Eurocom’s laptops in the past so I was curious if this latest model would continue their winning streak. Looking under the hood of this laptop reveals that Eurocom, as usual, isn’t messing around when it comes to performance. Out of the box you’ll find it fully loaded with an Intel Core i7-4940MX Extreme Edition CPU running the show, with HD graphics 4600. The graphics are amped up with the power of an Nvidia GTX 850M GPU sporting 2GB DDR3 VRAM and Nvidia Battery Boost / GPU Boost 2.0. All of that is supported with a glorious 16GB of DDR3 RAM so whether you’re editing large multimedia files, or enjoying the latest games, you’ll be in great shape. In addition you’ll find a 1TB 7200 rpm HDD, TPM 1.0 hardware data encryption, a 17.3 inch screen with 1920x1080 native resolution, Ethernet and HDMI ports, plenty of USB ports, 802.11n WiFi, Bluetooth 4.0, a multi-memory card reader, webcam and even an 8x Dual layer multi DVD +/- RW/-RAM burner. What makes this laptop stand out so much is the amount of power they’ve managed to squeeze in to such a compact form factor. This unit has very pleasing styling to help it look minimal and streamlined. Sure it still has some weight and thickness to it, and you won’t want to use it as your daily carry machine, but if you are the type to judge a book by its cover, you’d be really shocked to find out how much tech and raw power has been crammed in to this machine judging by how it looks. It has all the power of a gaming PC with the appearance of a run of the mill laptop. This laptop has a very subtle look to it. It has a plastic exterior shell with a satin black underside, and a glossy grey up, with a pretty pattern applied over it for a touch of visual interest. All of the games and productivity tasks performed extremely well even when running at the PC’s native resolution with all graphical setting cranked up to their top levels. Its very refreshing to be able to see this sort of performance coming from a laptop. It makes this seem like the ideal solution for a college student, or LAN party enthusiast who wants to be able to enjoy their PC games without graphical sacrifice, while still being mobile and sensitive to restrictive space requirements. Even the audio wuality was pretty good right out of the box. It seems as though Eurocom has once again managed to impress me with the Eurocom Electra 3. 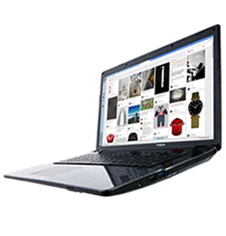 With most manufacturers trying to get the thinnest, lightest machines they can on to shelves, Eurocom is favoring power with this Laptop. If there ever was a brand that for me embodied the saying "speak softly and carry a big stick" it would be Eurocom. he latest model I’ve looked at is the Electra 3 from Eurocom. I’ve been a big fan of Eurocom’s laptops in the past so I was curious if this latest model would continue their winning streak. What makes this laptop stand out so much is the amount of power they’ve managed to squeeze in to such a compact form factor. I’ve used other desktop replacement and gaming laptops before, but they have a tendency to be chunky, bulky affairs, that weigh a lot and look like it too. This unit has very pleasing styling to help it look minimal and streamlined. Sure it still has some weight and thickness to it, and you won’t want to use it as your daily carry machine, but if you are the type to judge a book by its cover, you’d be really shocked to find out how much tech and raw power has been crammed in to this machine judging by how it looks. It has all the power of a gaming PC with the appearance of a run of the mill laptop. All of the games and productivity tasks performed extremely well even when running at the PC’s native resolution with all graphical setting cranked up to their top levels. Its very refreshing to be able to see this sort of performance coming from a laptop. It makes this seem like the ideal solution for a college student, or LAN party enthusiast who wants to be able to enjoy their PC games without graphical sacrifice, while still being mobile and sensitive to restrictive space requirements. Even the audio wuality was pretty good right out of the box. Unfortunately when running games at high settings the fans kicked in to keep this laptop from overheating. They engaged pretty much instantly for me and while I’ve heard louder fan noise from a laptop before, you’ll probably be able to still hear the hum of these fans over the speakers, and as a result will probably want to plug in some headphones for those more serious immersive gaming sessions. Thankfully the hot air is vented out the left hand side of the unit, so most people won’t have to suffer the discomfort of heat being exhausted on to their mouse hand. It seems as though Eurocom has once again managed to impress me. With most manufacturers trying to get the thinnest, lightest machines they can on to shelves, Eurocom is favoring power with this Laptop. If there ever was a brand that for me embodied the saying ‘speak softly and carry a big stick’ it would be Eurocom. At a glance, the laptop is nothing to write home about. Its styled nicely enough without sticking out like a sore thumb. You might struggle to look at this laptop and call it ‘different’ but once you power it on and see what it offers your tune will quickly change. It is a powerhouse of a machine and delivers more gaming muscle than any laptop has a right to.